Rotary entered a team for another of Robin Moorcroft's quizzes, this one in aid of the Carnival, in the Town Hall on Friday 20th. Tyrell Sandry organised the team with Nick Pickles, Nick Rowles, Bob Romans and Kevin Smith, but missing Stuart Hutchison. In the first round, the team knew that there were three 'Thompson Twins', a Bombay duck is really a fish, a black box is orange, but not that Oktoberfest starts in September (we thought November) or that a French horn originated in Germany, for a score of 15 out of 20. In the second round, general knowledge, we scored 16, which would have been 17 had we not over-ruled Nick P's correct answer of Surrey for the most wooded English county. The third round was based on the teams present, and we correctly identified that the WI originated in Canada and (thank goodness) that Rotarians give 16 million hours of service a year, though we failed to acknowledge that 1.4 million is the number of Lions worldwide, for 13 points. Round four was music. In the absence of Stuart we had our hopes for this round pinned on the music question setter, absent at the start of the evening, not arriving in time. Sadly, he did. We spotted two out of ten acts (UB40 and the Swinging Blue Jeans) and four out of ten song titles, for a less than stunning six points. We scored 18 in the 'Dingbats' picture round that ran through the evening, but everyone else got about that as well. 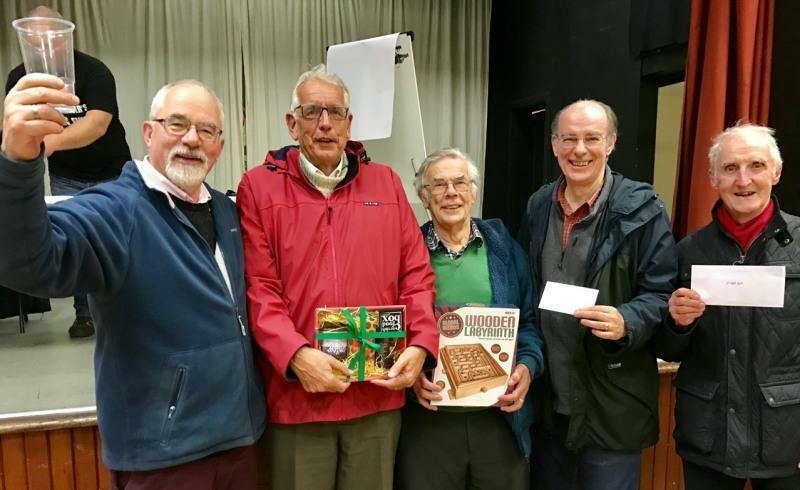 We ended up 13th, with 68 points, behind the Camera Club (to the delight of Jane Pickles), and the Canny Cornish (featuring Rtn Ceri Goodfellow) who were 2nd equal on 78, with recurrent winners 'Dads' triumphing again on 78.5. The Rotary team triumphed in the raffle, however, with every team member winning a prize. The quiz made £537, according to Robin - a worthwhile evening's work.